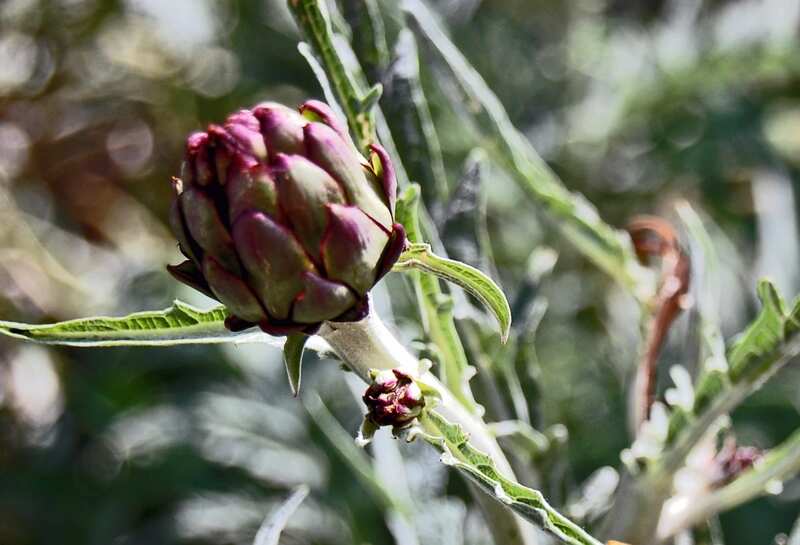 One thing not to miss whilst eating out on holidays in Abruzzo is those most noble of thistles – the delicate artichoke and the peppery cardoon. In everyone’s little vegetable gardens (il orto) in Abruzzo you will see one or the other growing most often side by side ready for their seasonal harvest, autumn & winter cardoons, spring & summer artichokes. But how can you tell the difference, if like us you’d never had a ’cardoon’ before? Quite simply for a cardoon it is its stalks that you will be served and eat and you won’t be offered them at the height of summer – the warmer the weather the bitterer the stalks become. They are a like eating something that is a cross between celery and peppery rhubarb. If you are renting a villa or holiday home in Abruzzo and you want to try cooking you can buy a bundle at the local supermarket and it is the main stalk that you will need to whittle away from the leaves & stingy fibres, chop and leave to soak in water with a little juice added for a good 10 minutes before cooking. They are generally served in restaurants as soup which is also eaten as the traditional main course soup for Christmas Eve. So if you are presented with a delicious soup with what looks like celery and small meatballs but which has a peppery flavour instead of the expected celery – that is Il Cardone or zuppa di cardi. On the other hand if like me you love artichokes (carciofi) Abruzzo is the place to visit between May & August. Ideally May & June as this is the time for their glorious fava (broadbeans) and the sweetest of fresh peas which to accompany your artichokes and savour without anything needed apart from a drizzle of olive oil. If you are lucky and staying in a holiday home a kind neighbour may bring you back some wild asparagus that they have just picked then you really do have a vedure delight. Eating out in Abruzzo the best artichokes we have had have been served with calamari or in a soup again, Zuppa Abruzzese di Fave con Piselli e Carciofi, a light mixture of all those beautiful first-harvest ingredients with a little bit of ham for extra flavour & potato added – perfect!